MARSHALL: And he was along, he was along with, uh, George Goodman’s daddy. MASHATT: Well, I know he have to build that. MASHATT: And, uh, he, he also owned, right up there on, what is it, Washtenaw? MASHATT: Coming through those—coming through that thing there. Washtenaw. I can’t think of the corner. But I know there’s a light there, come to Eastern. MARSHALL: Oh, yeah. I know what you’re talking about. MARSHALL: Yeah. [Car industry]. I know what you’re talking about [down there], mm-hmm. MASHATT: But see, he never redeemed that. MASHATT: He, he just never redeemed it. MASHATT: And, uh, he died in Detroit. MASHATT: And, I wish that I had gotten a little more, a little more information from him. MASHATT: But his, his daughter kinda kept him separated from me. MASHATT: Because I guess she felt as though I wanted something. But I did want something from him. MASHATT: How do I, how do I fit into the family? But, it was just, it was just something that…and I enjoyed the family, too, because [boo trees], I mean, Kenny, I think I got pictures of Kenny and, and Don, and, I think it was [corn], I think there was four [ship] but anyhow, I think I still got pictures. MARSHALL: Well, now, you, you know, uh, it-who was your husband’s name? MARSHALL:	Now, what was the father named? MARSHALL: That was William Mashatt. MARSHALL:	And, uh, now, are, are all of the, all of the Mashatts, the, Donald your hus-band and his brothers all, they all dead? MASHATT: Right. They all dead. MARSHALL: Oh. Then the Mashatts that are still living now are perhaps just grandchildren. MASHATT:	and children and grandchildren, right. MASHATT:	And great, great-grandchildren, I guess. MARSHALL:	Where did the Mashatts come from originally [on it]? MARSHALL:	They came here from Detroit. MARSHALL:	And do you know where they came from before Detroit? MARSHALL:	On Adams Street School? MASHATT:	On Adams Street, right. And I think that I have pictures of him and his teacher. MARSHALL: Uh-huh. Would that have been Mrs. Kersey? MARSHALL:	Reason I said that, I got a picture of, of that school with the students, about 1919, and Mrs. Kersey’s standing out there with them. MARSHALL:	You know about the Walls, don’t you? They’ve been searching their history. MASHATT:	Yeah? Because the Walls and the Scotts all come in together. MARSHALL:	Well, so many people have come over from Canada, over here, and that’s been happening for [since] way back. MARSHALL:	1842, so far as I can tell, the first wedding was held here, it was Morton. M-O-R-T-O-N.
MARSHALL:	was the ancestor of [Turntime] Morton. 1842. And Robert Morton married a girl from Canada whose name was Anne Higdon. MARSHALL:	Anne Higdon had been a slave in Maryland. She had been freed, and made 5:00her way to Canada. Either she was freed, or ran away or something. MARSHALL:	But she went to this school over there, that this man, [Monk] Tom was his name, that [had a school being] Uncle Tom’s Cabin. MARSHALL: He had a little school over there. She went to that school. And somehow, she made her way to Ypsilanti. And she married this guy Morton. In a house that stood right where the public library is now standing. Down-town. MARSHALL:	You know, they kept the bus right there. MARSHALL:	Well, there used to be a house there, and this house was owned by a man named [McKinstry]. Now, they were married in that house, in 1842. So far as I know, they were the first blacks to ever be married in Ypsilanti. MASHATT: Yeah, well, we were, we were still connected in with the Mortons! MARSHALL:	Yeah? Uh-huh. I’m glad to hear that. MASHATT:	We was all connected into the Morton family. MARSHALL:	Well, Can you tell me anything about, do you remember, do you remember, what do you remember about the Mashatt business? Now I know he was a well digger for a while. MASHATT:	Now, I got papers out there that prove that he was a baker. MASHATT:	So, I guess Don took it up from there. MARSHALL:	What about these sons? of, of his? Now, um, William had, was it four sons? MASHATT:	Yeah? But let me see, it was Kenny, Don…I don’t know whether it was any more or not. But I know that I’m going to have to get you the picture. MASHATT:	’Cause I don’t know, I thought I started to throw those pictures out. MARSHALL:	I think we all tend to do that every now and then. MASHATT:	I said, well, what is the, you know, what is, what is the point of keeping up with past history? MASHATT:	You know. Past history. MASHATT:	And I said, past history, you know, and I said, no, I better not do that. So, I think that I have a few pictures. MARSHALL:	Well, I hope you do, ’cause I have absolutely--At this particular point, even though the Mashatts is a family I’ve been searching for, I don’t think I have any pictures of Mashatts. MARSHALL:	And it has, uh, it’s, it’s, it’s the Adams Street School, 1919, it’s got a lot of kids on it. MARSHALL:	That’s what I’m talking about! MARSHALL:	Well, now, see, Mrs. Kersey’s easy to, to, to identify. I mean, I 9:00can identify her. But, one, see, Hazen was able to identify maybe a half-dozen of these kids. OK. Then I go to somebody else, and they say, “Oh, that’s somebody I know!” well, eventually I’ll have them all filled in. MARSHALL:	You see my [part]? MARSHALL:	So I show them to enough people, now, uh, I don’t think I’ve had any pictures that everybody could identify. MARSHALL:	But that’s ’cause, after all, kids change, and they change an awful lot. MARSHALL:	I don’t have too much trouble with adults, uh, I’ve got some old pictures of, old Palm Leaf Club, like that, they had some in the paper here not long ago. MASHATT:	Yeah, I saw them. MARSHALL:	I knew who they were. I got their names down but they didn’t ask me (laughs). MARSHALL:	They didn’t ask me—I could have told them who they were! MARSHALL:	Oh, let’s see, the [lighten,] there was Mrs. Carver in there, and of course, Lucille was in there, Lucille Richardson. MASHATT:	Not, not Lucille, but was a light lady that had a store. [To kids]: Would you all please stop making that racket? Um, this lady that had a store over on, over on Monroe, Madison, Madison. Yeah, Madison. I recognized her, and I worked for her, for a while. And Mrs. Dorsey had her for a while. MARSHALL:	Yeah. Uh-huh [That’s so I] talk to Mrs. Dorsey, yeah. MARSHALL:	I got to talk to her too. MASHATT: She died up there. MASHATT:	Hmph. I can’t think—Mrs. Aray. MARSHALL:	You knew Mrs. Aray. MASHATT:	Yep. They’re all gone. MASHATT:	But it’s just-it just seems like, you know, I have, I have really set down and, and thought of the different people that were along this [route]. MARSHALL:	Well, see, you’re talking about a lot of generations, remember now! Every twenty years you got a new generation. MARSHALL:	And, and what we’re talking about here, when I’m talking about the 12:00history of the blacks in Ypsilanti, that’s seven generations. MARSHALL:	To 1860, was the first one. MARSHALL:	1860 to 1880 was the second one, 1880 to 1900 was the third. MARSHALL:	OK. Now you got four generations from 1900 up to 1980. So you’re talking about seven generations here. MARSHALL:	That’s, that’s a lot of people (laughs). That’s a long time! MARSHALL:	Now, most of us last through that period, but our productive period is about twenty years. MARSHALL:	For example, I’m, and, I’m, I’m almost, well, I’ll be 67 on my next birthday, but, uh, my productive period was still about twenty years. MARSHALL:	And that’s, that’s generally what it is. By the time a person is 40, usually they’re through having children, and their children are beginning to get grown. That’s that second generation coming along. And if they stay 13:00around long, they may be able to see another generation come. But they’re moving [me] down, they’re moving off. MARSHALL: So usually [this kind of] generation is being twenty years. MASHATT: Well, you just give me a chance, to, uh, you just give me a chance to go in the attic and go in my box and get those pictures together. MARSHALL:	Any pictures that you have of Mashatt [support], and particularly—[not just] the men, I’m not just interested in the men, I’m interested in any of it, and, uh, and I would be interested, also, on some of the descendants. Um, when we talk about history, we, we can say 1840 is history, but so is yesterday. MARSHALL:	History. See what I’m saying here? That, uh, we don’t, we don’t sometimes think of it like that, but what happened yesterday is now history. MASHATT:	Wouldn’t that be nice? MARSHALL:	You see, and can have some pride. MARSHALL:	Now, I’m always telling people—see, that, that, that’s uh, well, that’s just—I, I soon found that out. MARSHALL:	So many people who came, who are here now came from Canada. MASHATT:	Goodman, yeah, uh, it was just all, just, look like they just married each other. MASHATT:	And that’s how come we got so many illiterates. MASHATT:	You don’t know who’s in love with who. MASHATT:	Or until you get, uh, a funeral, you never know who’s who. MASHATT:	Yep. You just never know who’s who. So let me get—let me just get, have a time to get these pictures together. MARSHALL:	And see if you can, see if you can come up with—I’d like to run each one of those families down, and sometimes it takes a piece of paper if possible, and take each one of those children, well, let me, let me use you as a example. Put down your husband’s name, and then put down your name. Not only your name but also your including your, your, your family name. Your own family name. And then put down the date you were married, and then put down the children, and the date they were married, and the date they were born, and 17:00[lemash] and when they married, and then if they have children, put them down. And that way, you’ll help me in structuring this. And, and I’ll tell you in, in front, what I’m going to do with it—it’ll be downtown in the Historical Society. MARSHALL: It’ll be on file down there. MARSHALL:	I would appreciate it. MASHATT: I can’t think of her name. But anyhow, but he had—but he didn’t have no kids by her, but he took on the responsibility of this baby. And I 18:00thought that was real nice. But, um, Cole. That’s who it was. Gladys Cole. And she [was] actually was from Ohio. But she died here. And then, her and I was friends [buzzing noise] and I just started [buzzing noise] [going] He just wasn’t no good and I was just getting even. That’s how I [buried him]. MARSHALL:	I appreciate it! Anything [you can do]. Partial Transcript: MASHATT: On campus. Segment Synopsis: A.P. Marshall and Mrs. Mashatt discuss the history of the Mashatt family in the Ypsilanti area as well as Mrs. Mashatt's family, the Scotts from Ann Arbor. Mr. Marshall relates the story of the Ypsilanti first marriage of a Black couple, the Mortons, in 1842. 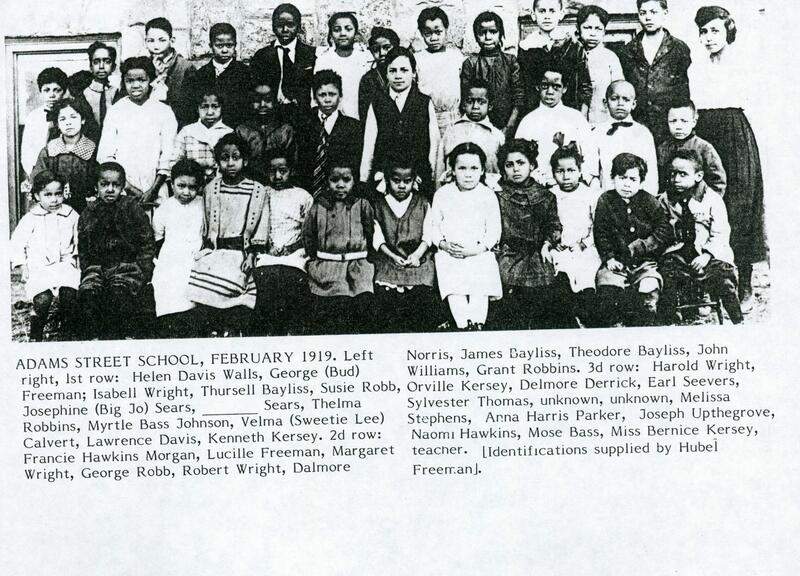 Hyperlink: The 1919 photo of the Adams Street school that Mr. Marshall and Mrs. Mashatt discuss, with identifications. Partial Transcript: MARSHALL: I don’t have too much trouble with adults, uh, I’ve got some old pictures of, old Palm Leaf Club, like that, they had some in the paper here not long ago. MASHATT: Yeah, I saw them. MARSHALL: Well, they said they put those pictures in and had two-three people there, uh—‘unknown. Segment Synopsis: A.P. Marshall talk about the history of Ypsilanti and the need to preserve the story of Black Ypsilanti. He and Mrs. Mashatt discuss looking for old photos. A.P. Marshall lays out his vision of collecting history for future generations to have pride in their past. 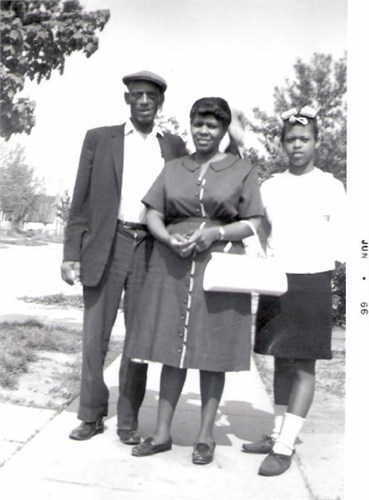 Hyperlink: Donald and Erma Mashatt with daughter. Partial Transcript: MARSHALL: So many people who came, who are here now came from Canada. Segment Synopsis: Mrs. Mashatt discusses the close family connections that Ypsilantians from Canada had and how tight-knit the community became here. Mr. Marshall and Mrs. Mashatt make plans to document the family's history. Hyperlink: A page from the South Adams @ 1900 website looking at Ypsilanti's close connections to Canada.